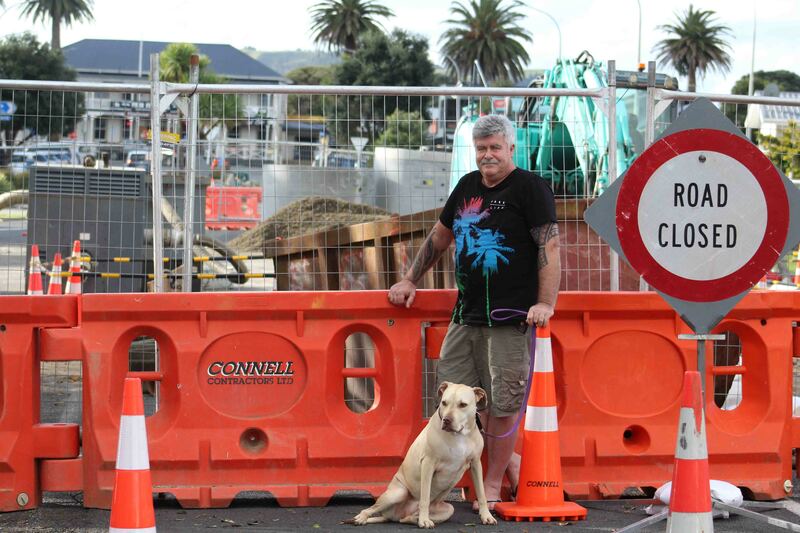 Recent protests at the stormwater upgrades on Wainui Road are just another example of Waikato District Council’s dereliction of duty, Whaingaroa Harbour Care stalwart and Waikato Regional councillor Fred Lichtwark says. WDC was served a non-compliance letter by Waikato Regional Council infrastructure team leader Hugh Keane pointing out the discharges authorised by the consent are unlawful, but no formal enforcement action would be taken. “If it were you or me doing non-compliant work on our own property we would have to stop and have to pay to rectify it,” Fred says. Waikato Regional Council Resource Use Manager, Brent Sinclair, says the consent that authorises the discharge of stormwater from Raglan township was granted in 2008 and is subject to more than 40 consent conditions. Fred believes the non-compliant work adds to a list of environmental breaches and he questions WDC’s duty of care for Whaingaroa’s natural environment. Fred says, issues such as Wainui Reserve wetlands being drained using tires that leach pollutant into the Wainui Stream; cattle busting through Wainui Reserve fences in disrepair (for which they have been issued an abatement notice); shoddy work causing safety issues at the Wallis Street boardwalk and various considerations made to developers that compromise the harbour water quality. He believes the Raglan community needs to be vocal about concerns they have over WDC stormwater solutions for Whaingaroa Harbour. Waikato District Council Waters Manager, Karl Pavlovich, says a new EnviroPod has been installed in a stormwater catchpit sump within the Wainui Road site, which removes the majority of gross pollutants and suspended solids, reducing particulate bound pollutants such as heavy metals, oil, and grease. The district council also propose to reinstate some muddy roadside berm areas with the construction of kerbing and a planted swale to treat stormwater runoff from parking/adjacent road prior to discharge to harbour at the Joyce Petchell Park carpark upgrade. Pavlovich acknowledges that in 2016/17, the council did not comply with the resource consent condition to hold an annual meeting with the Tangata Whenua and Key Stakeholder Liaison Group but a meeting was held in 2017/18 and another is planned for later this year. He says the stormwater upgrade will improve the capacity of the system, and will reduce the severity and frequency of the ponding and runoff experienced. WDC will hold a meeting about stormwater treatment solutions with the community liaison group and tangata whenua on Friday, September 7 at 10am at the town hall supper rooms.